Tough Mudder brings an obstacle course to Chicago Rockford International Airport on May 21-22. April 15, 5:30-8:30 p.m. Stand-up comedy meets practical parenting with a pillow fight, sponsored by area churches. Rockford Lutheran High School, 3411 N. Alpine Road, Rockford, (815) 962-4297, rockthegood.com. April 16, 7 p.m., doors 6 p.m. Join the Rage in celebrating a #DecadeOfDerby by watching a roller derby game. Afterwards, join the Rage and Desolation Row at Neighbors Bar & Grill for a killer after-party. MercyRockford Sportscore 2 Indoor Sports Center, 8800 E. Riverside Blvd., Loves Park, Ill., facebook.com/pages/The-Rockford-Rage. April 16, 6 p.m.-8 p.m. Dust off your flapper dress, zoot suits and Tommy guns and get ready for your Roaring Twenties Murder Mystery Party. Light refreshments will be served after the game is complete. Tinker Swiss Cottage Museum and Gardens, 411 Kent St., Rockford, (815) 964-2424, tinkercottage.com/murder-mystery-night.html. April 17, 1 p.m. The annual spring classic is a traditional springtime Sunday afternoon special featuring the “best weekly warriors in the country,” the Big 8 Late Model Series presented by Gandrud Chevrolet. Rockford Speedway, 9572 Forest Hills Road, Loves Park, Ill., (815) 633-1500, rockfordspeedway.com. April 23, 8 a.m.-5 p.m. Celebrate Ulysses S. Grant’s birthday with Civil War re-enactments and encampments, the Galena Fire Department’s bucket brigade and a parade down Galena’s Historic Main Square. Various locations, downtown Galena, (815) 397-0210, blackhawkscouting.org. April 23-24, 9 a.m.-4 p.m. Take a step back in time to experience American frontier life through the 1840s. Meet traders and trappers, French voyageurs and Native Americans. Tour original buildings on a national historic site and meet Stephen Mack as he shares his home with you. Plenty of hands-on activities, music and much more. Macktown Living History Center, 2221 Freeport Road, Rockton, Ill., (815) 624-4200, macktownlivinghistory.com. April 24, 1 p.m. YMCA Heritage Run presented by OSF HealthCare includes 10k (6.2 miles) and 2-mille races starting downtown and going through historic Rockford neighborhoods. Includes a free half-mile kids race and Healthy Kids activities. Starting point: West State & Wyman Streets, downtown Rockford. Info: (779) 774-4428, rockriverymca.org/heritagerun. April 29, noon-5 p.m. Try your hand at nine mini putt-putt holes located around downtown Freeport. Sign up at freeportdowntown.com. April 29, 6:30 p.m. The third annual Arbor Dash is a fun trail run through Klehm’s grounds via paved paths and dirt trails. Enjoy the scenic landscape and invite your friends to join you. Klehm Arboretum & Botanic Garden, 2715 S. Main St., Rockford, (815) 965-8146, klehm.org/arbor5k. May 4, 5:30-8 p.m. Taste dozens of Rockford-area restaurants’ best dishes. There will be a winner for best appetizer, best entree and best dessert – from which judges will award an overall “Rockford’s Best Dish.” Cliffbreakers Restaurant, 700 W. Riverside Blvd., Rockford, (815) 963-1609, rockfordsbestdish.com. May 6, 5 p.m.-midnight. Each month, downtown art galleries, shops, music and theater venues work together to stay open late and share new art, music and goods. Downtown Rockford, (779) 537-5319, facebook.com/FirstFridaysRockford. May 7, 9 a.m. race start. Strut your stuff for a good cause in this 5k walk/run. Proceeds benefit the YMCA’s annual campaign providing opportunities for kids and adults in northwest Illinois to build confidence. Family YMCA of Northwest Illinois, 2998 W. Pearl City Road, Freeport, (815) 235-9622. May 8, 10 a.m.-3 p.m. Tour the pre-Civil War Lincoln-Tallman House. To celebrate Mother’s Day, The Rock County Historical Society is waiving the admission fee for all moms. Tours begin at the Helen Jeffris Wood Museum Center, 426 N. Jackson St., Janesville, (608) 756-4509, rchs.us. May 14, 3 p.m.-7 p.m. Union Dairy and the Freeport Lions Club host this car show with proceeds benefiting the Lions Club. 3-D sound provides exciting entertainment. Union Dairy, 126 E. Douglas St., Freeport, (815) 232-7099. May 14, 6-8 p.m. Participate in a murder mystery party where someone in your group is the culprit, and enjoy light refreshments after the game is complete. Tinker Swiss Cottage Museum and Gardens, Rockford, (815) 964-2424, tinkercottage.com/murder-mystery-night.html. May 14-15, 8 a.m.-5 p.m. Browse through more than 500 vendors selling everything from antiques and collectibles to crafts and home goods. Winnebago County Fairgrounds, 500 W. 1st St., Pecatonica, Ill., (815) 239-1641, winnebagocountyfair.com. May 14-15, 10 a.m.-6 p.m. Enjoy an Old World experience with exotic vendors and performances. Traxler Park, Janesville, (608) 322-8813, jvlrenfaire.com. May 14, 8 a.m. A 6.2-mile run/walk through scenic forest preserves. Vasa Park, 6616 42nd St., Rockford, runsignup.com/race/il/Rockford/literacyhalfmarathon10kfunrunwalk. May 21, 7 p.m., doors 6 p.m. The Rockford Rage close their spring season. Participants in this skater-run, nonprofit league are dedicated to skating, competing and entertaining. A portion of the proceeds benefit local charities. MercyRockford Sportscore 2 Indoor Sports Center, Loves Park, Ill., facebook.com/pages/The-Rockford-Rage. May 21-22, start times vary. 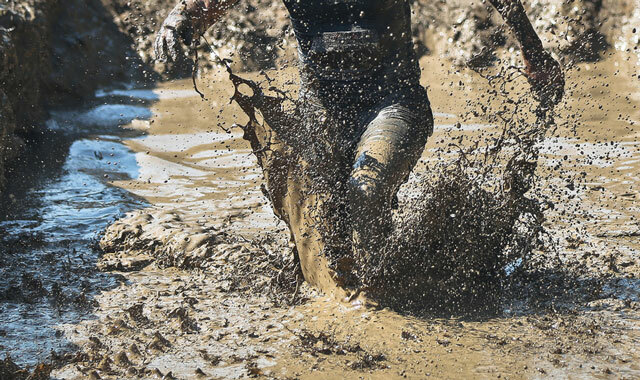 Tough Mudder brings new 5-plus mile obstacle courses to Rockford as part of a two-day event. Chicago Rockford International Airport, 2 Airport Cir., Rockford, toughmudder.com/events/2016-chicago. May 23, 6 p.m. All things rhubarb are on the menu during the Annual Rhubarb Fest. The event raises funds for the Rockton Township Historical Society. Carriage House Museum, 529 Green St., Rockton, Ill., (815) 624-8200, rocktontownshiphistoricalsociety.com. May 27-30, times vary. More than 35,000 people attend the Midwest’s premier community festival, dedicated to the celebration of all things chocolate. Experience games, rides, cooking demonstrations, and of course, chocolate. Chocolate Festival Grounds, State Road 36, Burlington, Wis., (414) 254-4813, chocolatefest.com. May 27-May 30, recurring daily. Enjoy live music, a beer garden, carnival rides, kids’ activities and food concessions. Loves Park City Hall Grounds, 100 Heart Blvd., Loves Park, Ill., (815) 633-3999, youngatheartfestival.com. May 28, 8 a.m. 5k walk/run; 9 a.m. half-mile kids fun run. Awards given to overall female and male and top three in age divisions. Pecatonica Library, 400 W. 11th St., Pecatonica, Ill., runsignup.com. May 28, 9 a.m. Get ready for a colorful, fun-filled day. Get blasted with color while you run a 3.1-mile route. Boone County Fairgrounds, 8791 Illinois Rt. 76, Belvidere, Ill., thecolorvibe.com/Rockford.php. May 30, 11 a.m. Members of the National Guard, various veterans units and members of Parker and Craig high school bands march in the Memorial Day Parade. Milwaukee & Main Streets, Janesville, (608) 755-3030, janesville.wi.us. June 3, 5 p.m.-midnight. Each month downtown art galleries, shops, music and theater venues work together to stay open late and celebrate great new art, music and goods. Downtown Rockford, (779) 537-5319, facebook.com/FirstFridaysRockford. June 3, 5 p.m. View classic cars on display. Historic Courthouse Square, 1016 16th Ave., Monroe, Wis., (608) 328-4023, mainstreetmonroe.org. June 3-4, 8 a.m.-5 p.m. Explore 40 miles of Illinois Route 75 in the towns of Rockton, South Beloit, Harrison, Durand, Lake Summerset, Davis, Rock City and Dakota. Northern Illinois, along Illinois Highway 75, route75sales.com. June 3, 7-10 p.m. Listen to scintillating tales from paranormal experts, listen to audio clips and enjoy a tour with a chance to have your own paranormal encounter. Tinker Swiss Cottage Museum and Gardens, 411 Kent St., Rockford, (815) 964-2424, tinkercottage.com/paranormal.html. June 4, 8 a.m.-noon. Forest Preserves of Winnebago County invites the community to a free fishing event designed especially for families and kids. Bring your own equipment. Four Lakes Forest Preserve, 10207 Fish Hatchery Road, Pecatonica, Ill., (815) 877-6100, winnebagoforest.org. June 4, 8 a.m.-11 a.m. The Heart Walk promotes physical activity and heart-healthy living in a fun, family environment. Rock Valley College, 3301 N. Mulford Road, Rockford, tinyurl.com/hmr5equ. June 4, 8 a.m. Project 1013 strives to bring churches and our community together to serve those living in Ellis Heights, Rockford’s poorest neighborhood. Participate in a run/walk to benefit the organization. Rock Church, 6732 Harrison Ave., Rockford, (815) 229-7600, my.simplegive.com/f/?k=P8FR39IYDEBHFUVJ. June 11, time TBA. Honoring men affected by cancer, the event includes a 1.5-mile symbolic march, optional 5k run, food, live music, a wellness fair, children’s activities and more. Home Depot, 6930 Argus Dr., Rockford, (815) 977-4123, healingpathwayscrc.org. June 16-19, recurring daily. The largest music festival in the stateline area features live country music performances, a carnival, festival vendors, food booths, a 5k run/walk and fireworks after the last performance on Sunday. Settlers Park, E. Harwich St., Rockton, Ill., (815) 206-8525, oldsettlersdays.com. June 17-19, recurring daily. Now in its 24th annual running, this driver-friendly event offers phenomenal track time. Friday night ice cream social and Saturday night dinner. Blackhawk Farms Raceway, 15538 Prairie Road, South Beloit, Ill., (815) 389-2000, blackhawkfarms.com. June 25, 9 a.m.-1 p.m. Hike through several learning stations and take guided tours of the blooming prairie full of beautiful native wildflowers. Nygren Wetland Preserve, 3190 W. Rockton Road, Rockton, Ill., (815) 964-6666, naturalland.org. June 26, 1 p.m. The Dairy Days Parade celebrates agriculture in Stephenson County as it winds through the streets of downtown Freeport. Downtown Freeport, (815) 232-3186. This entry was posted on Thursday, April 21st, 2016 at 11:59 am	and is filed under Recreation & Destinations. You can follow any responses to this entry through the RSS 2.0 feed. Both comments and pings are currently closed.